On my recent trip to California I spent three days in the Los Angeles area before heading up the Central Valley to Stockton. 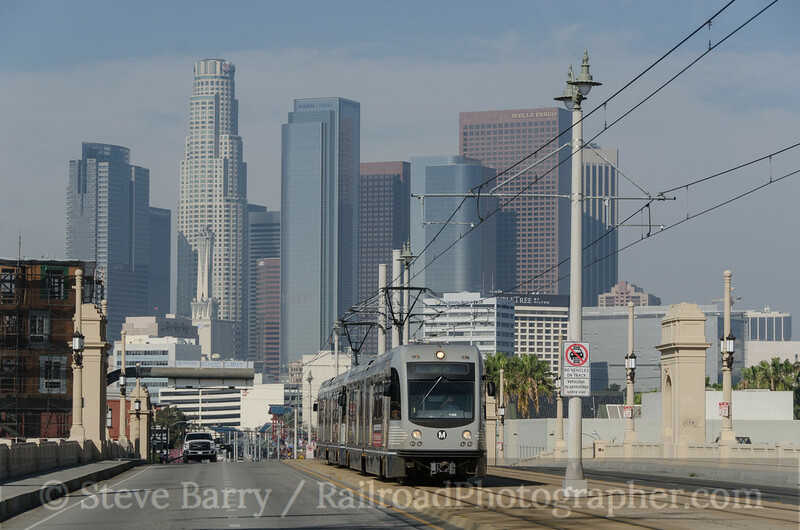 On my last day in L.A. (March 6, 2014) I decided to sit somewhere to watch trains until rush hour quieted down (which it really doesn't do in the L.A. area). 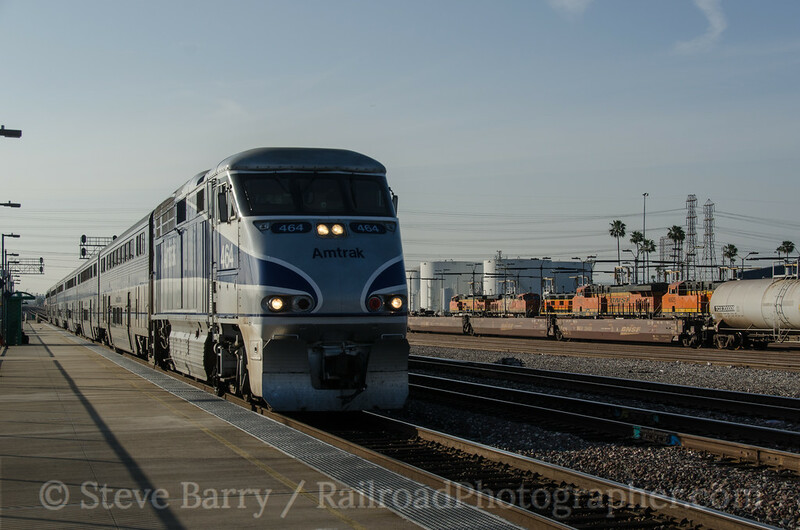 At the suggestion of Charles Freericks, I headed to the Metrolink station at Commerce, which sees frequent Amtrak trains in addition to Metrolink. 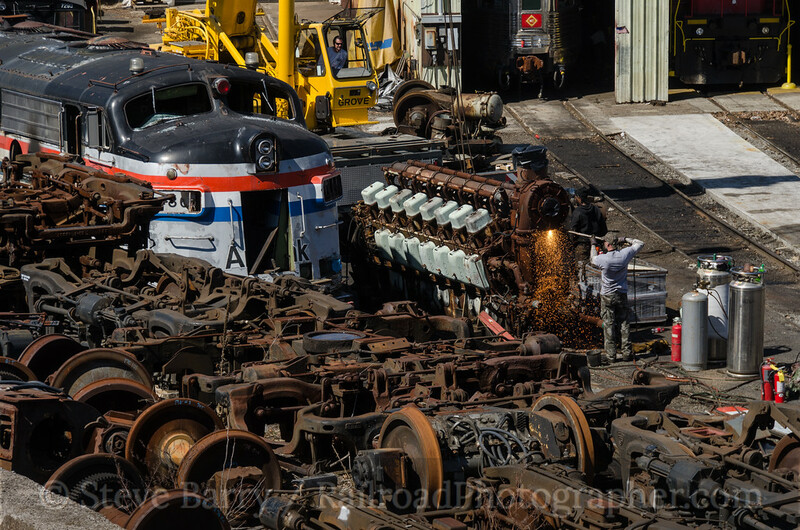 As an added bonus, BNSF Railway has a diesel maintenance facility just across the main line, and light engine moves are frequent into the facility. 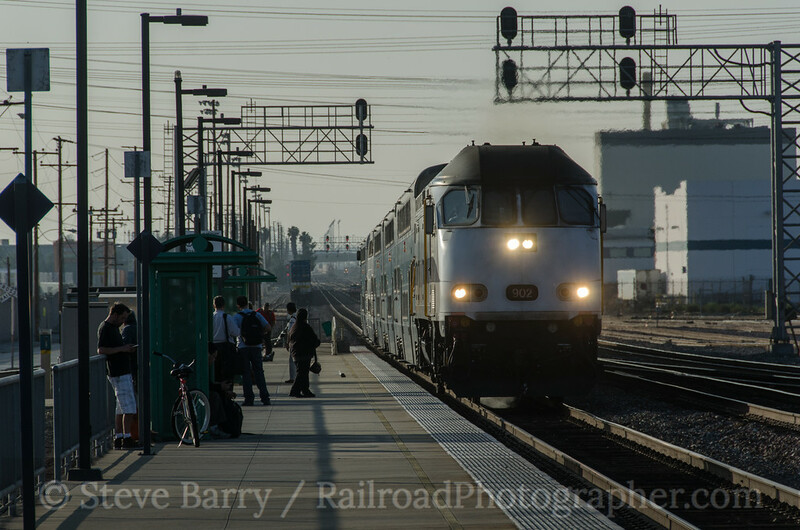 The evening started off with a southbound Pacific Surfliner for Amtrak arriving (above). 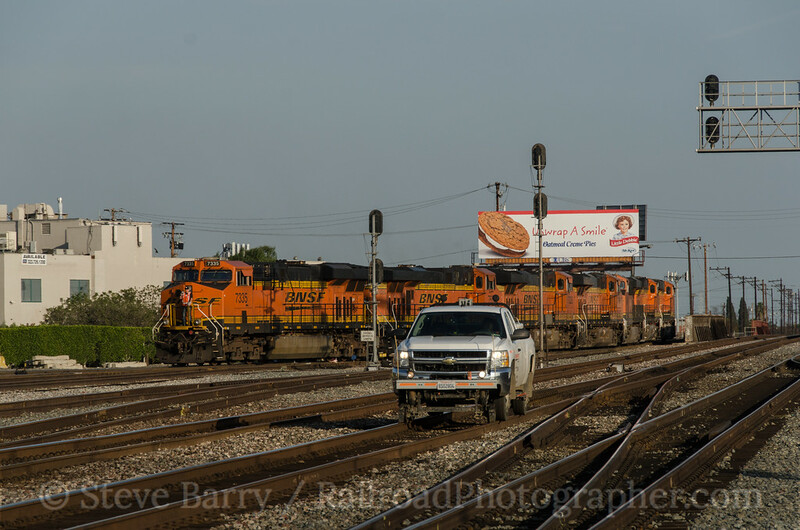 The BNSF power moves I saw all came from the west, rolled through the station area and entered the engine facility through the east switches. 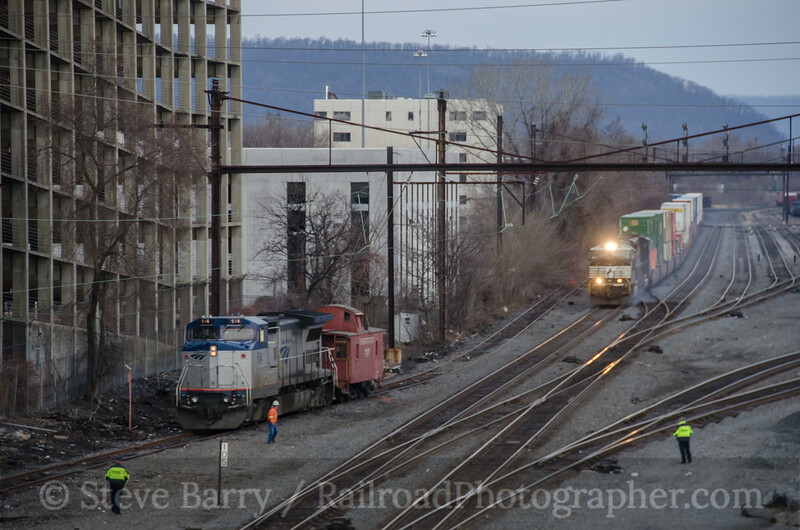 A light power move is almost at the end of its day as a hi-rail maintenance truck heads west on the main line. Despite the fact that the city is to the west, the eastbound platform was surprisingly busy in the evening. A few vans from local businesses dropped off passengers before this Metrolink train arrived. Not far behind that train was another Metrolink train. 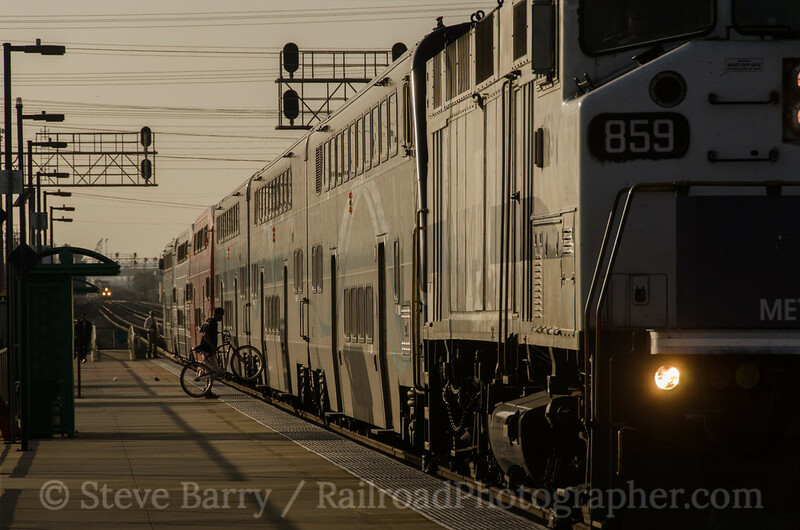 A bicycle is last on the eastbound train as a BNSF freight approaches from behind. That following train turns out to be an eastbound double-stack train. 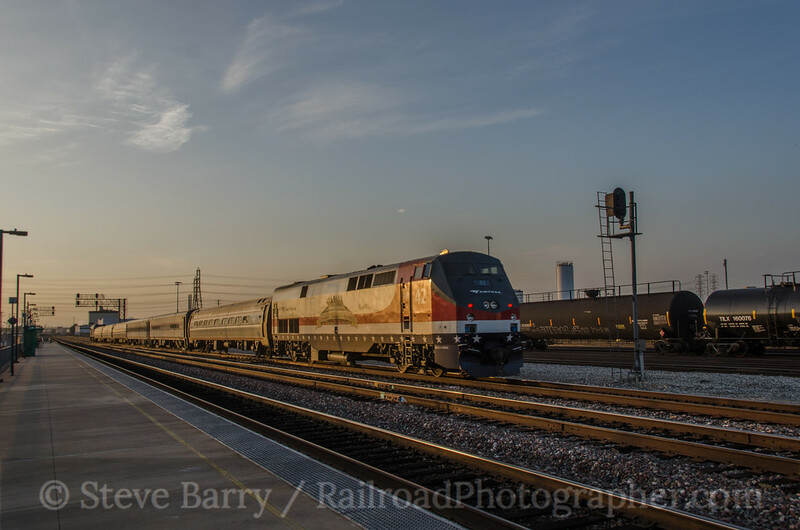 The Amtrak Pacific Surfliners and Metrolink trains all have locomotives on the east end and cab cars on the west end. In the afternoon, the locomotives are all backlit. 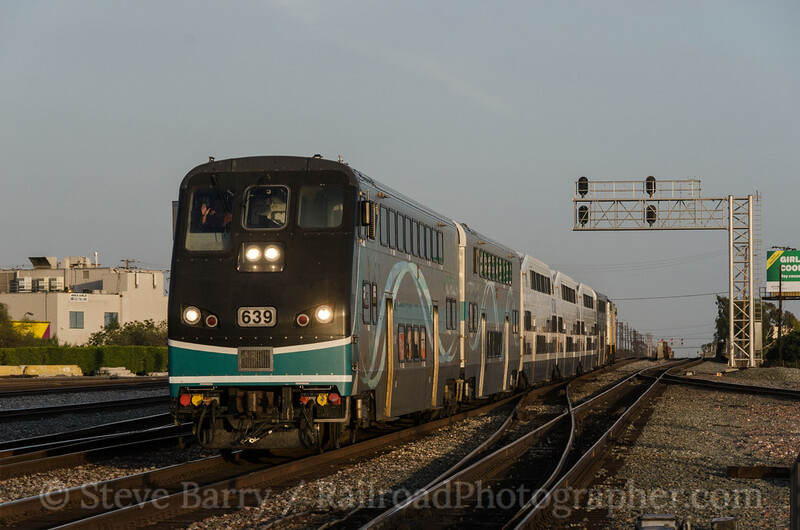 However, the Metrolink trains have the most photogenic cab cars in the U.S., with noses that give it a bit of a locomotive-like look as they approach. We see a westbound Metrolink train rolling through. The Commerce station only has one platform, so all trains making a stop use the near track. 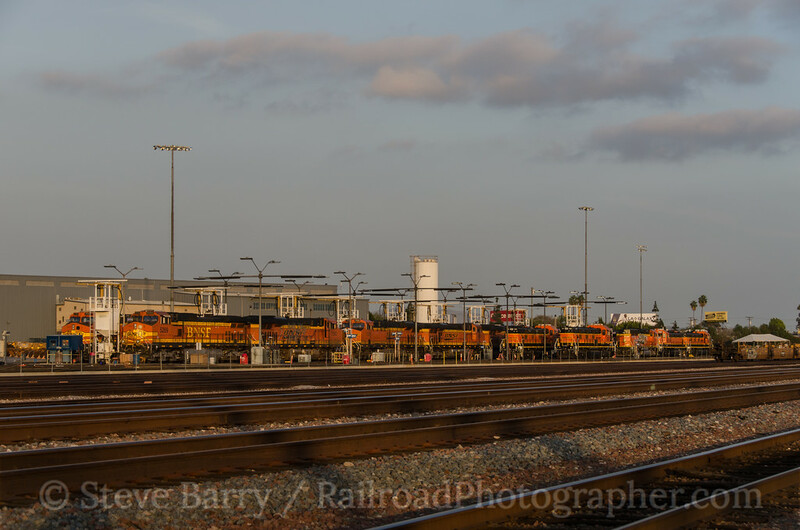 With a break in the action we have a few minutes to drive west past the freight cars sitting in the yard so we can look back into the BNSF engine facility. Here comes a westbound (northbound from San Diego) Pacific Surfliner and instead of the usual cab car leading, this one has one of Amtrak's converted F40 diesels. These converted diesels have lost their prime movers, and the extra space inside is used for baggage -- there are baggage doors added to the side. This combination of cab car and baggage car has led to these being referred to as "cabbages." Meanwhile, the power for this train is actually from a diesel pushing on the east end. Today, the diesel is a special one -- Amtrak No. 42 painted to honor U.S. military veterans. The sun is just about gone as the next Metrolink eastbound approaches. A green signal on the middle track indicates we might squeeze in one more westbound before we depart. The sun has, indeed, gone down as that westbound approaches. 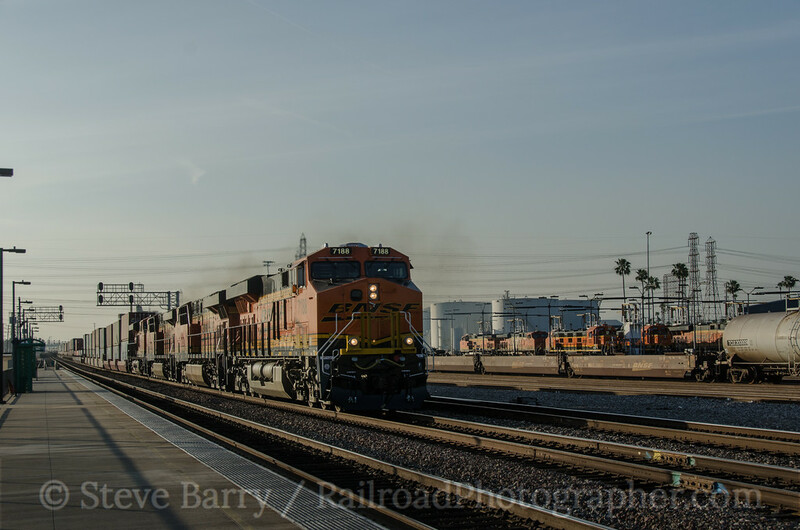 We squeeze off one shot of a BNSF stack train before heading off to the streets of Bakersfield for the night. Once again, thanks to Charles Freericks for suggesting heading to Commerce. 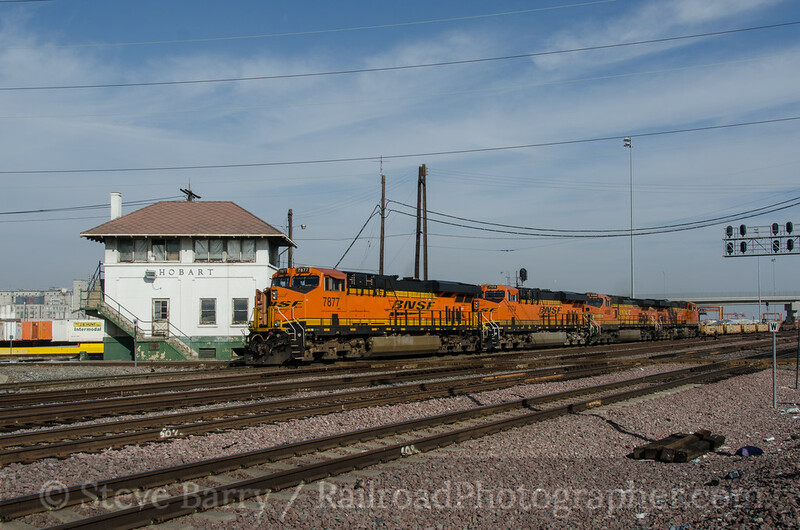 More shots from Commerce (and earlier in the day) can be found here. The Los Angeles area is sprawling and difficult to get through. Freeways are perpetually clogged, and even getting ten miles can take an hour or more. 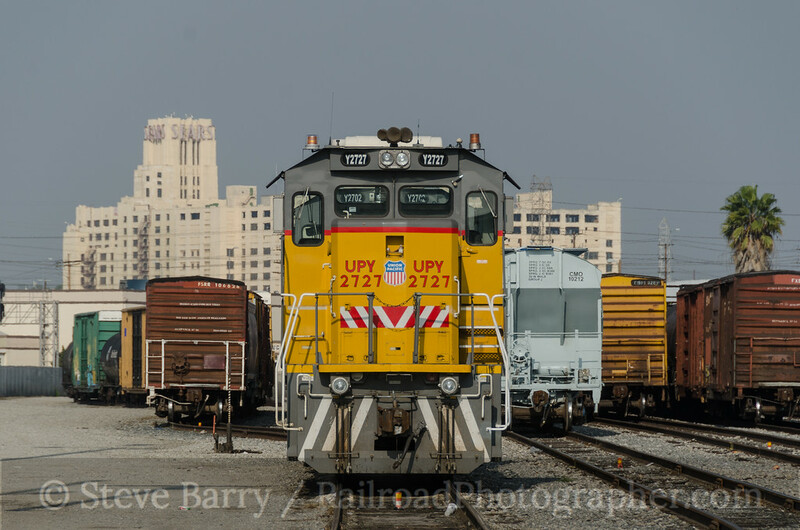 What can a visiting photographer do to see a lot of trains in interesting locations? Well, you don't have to go far from the very heart of the city to make the most of a visit to L.A. You simply need to follow the concrete ravine of the Los Angeles River. 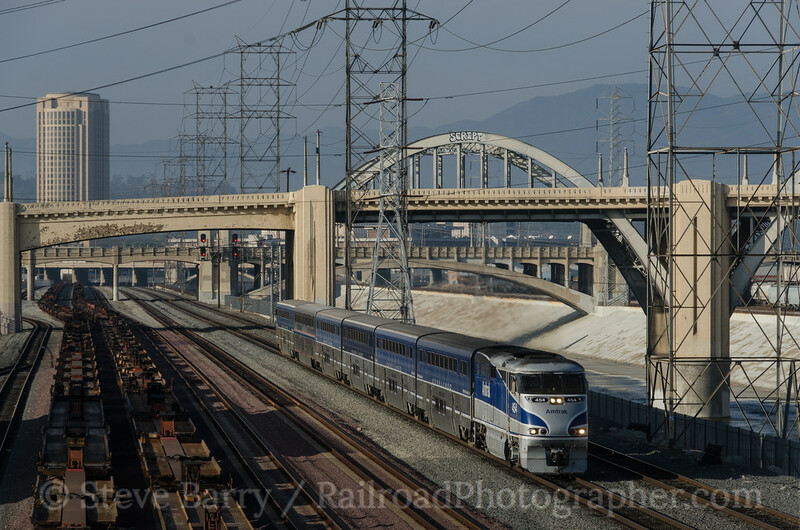 The Los Angeles River has several bridges crossing it, and all provide a view of Union Pacific, Amtrak and Metrolink heavy rail action. One has a Metro Rail light rail line on it, and two span the only above-ground section of the Metro Rail subway. Starting from north to south, we begin our tour at Cesar Chavez Avenue. 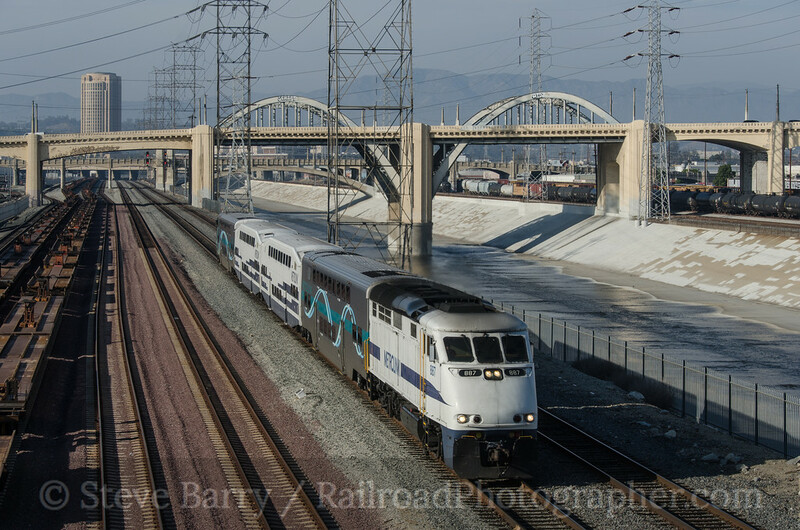 The west end of this bridge is right at Los Angeles Union Station (formerly Los Angeles Union Passenger Terminal). 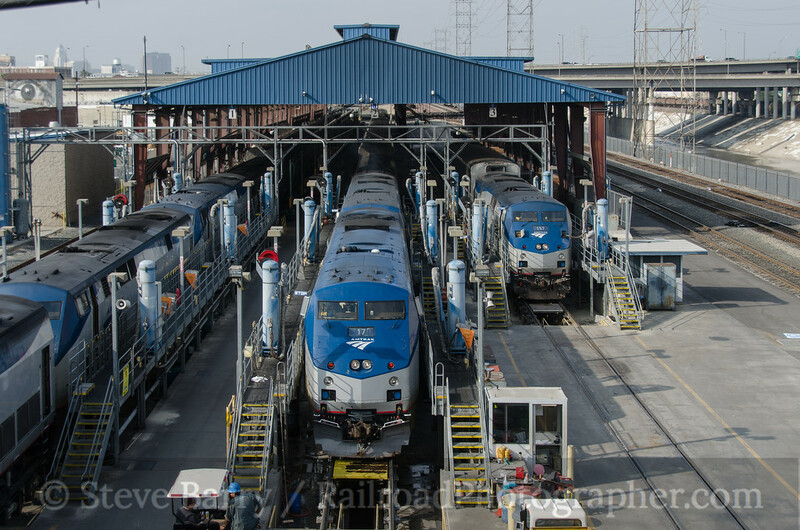 All Amtrak and Metrolink trains head north out of LAUPT to Mission Tower. Some continue north, but others make a horseshoe and come right under Cesar Chavez Avenue. 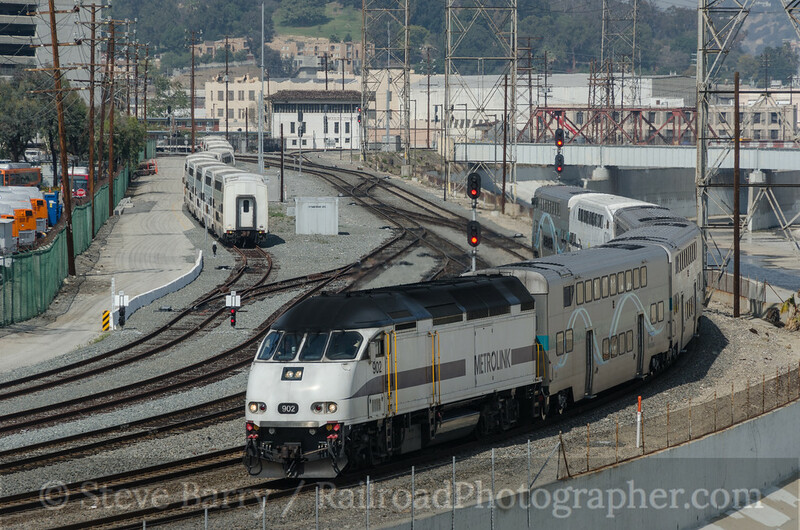 As an added bonus, the Metrolink trains and Amtrak Surfliners that use cab cars all have locomotives on the proper (geographic south) end of the train as they pass here (above). Mission Tower, which is pretty inaccessible, makes a nice backdrop for photos. 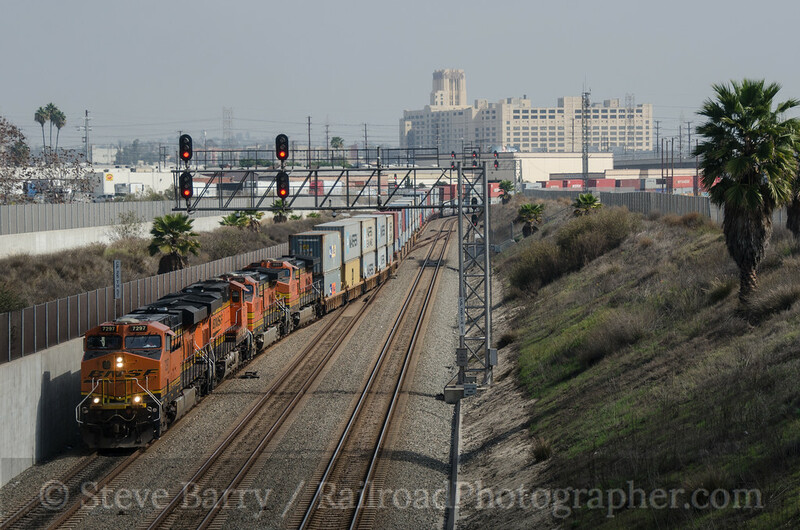 Union Pacific has an intermodal terminal on the east side of the Los Angeles River here, so freights are not uncommon (although most will diverge to the east before passing under the bridge). 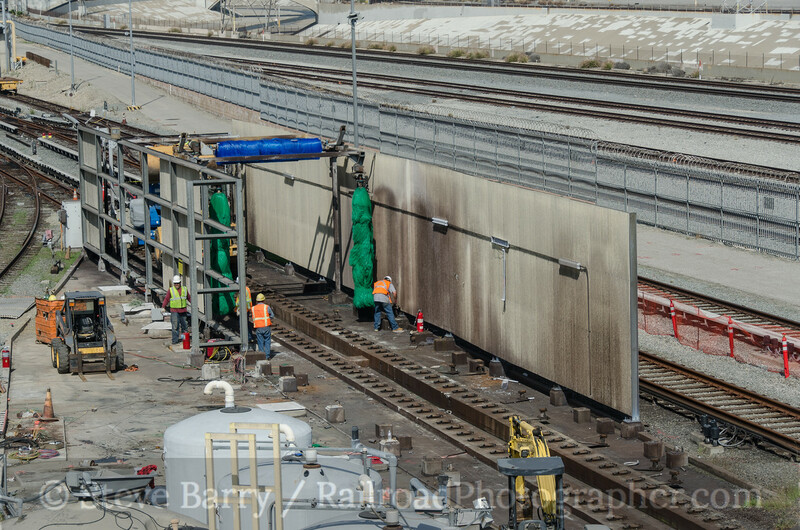 Still, you'll find both Metrolink and UP trains under the east end of the bridge. The 101 freeway is the next bridge south (no pedestrian access), followed by perhaps the most interesting bridge over the river (at least photographically), First Street. The west end of the bridge goes over the Metro Rail subway tracks, the only place the subway is above ground. This is the throat to the yard, so action is usually plentiful right after the morning rush hour and right before the evening rush. Alas, on the day I was there, the wash rack located almost under the bridge was being dismantled and the yard throat was closed most of the day. Trust me, though, it can be busy here. You still have the Metrolink/Amtrak line directly adjacent to the subway tracks. Perhaps the coolest thing about the First Street bridge is the Gold Line light rail line that runs across it. In the morning, there are spectacular views available of Metro Rail trains leaving the city with the skyline as a backdrop. Auto traffic heading out of town in the morning is sparse, so light rail vehicles are seldom blocked by other traffic. It really is a nice diversion between all the heavy rail action down below. Light rail stations are at either end of the bridge, so if you are in town without a car there is still easy access. 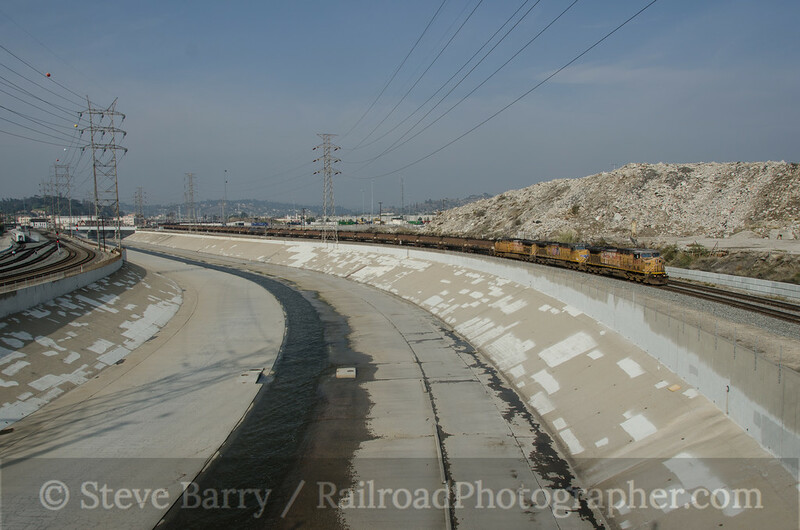 On the east side of the Los Angeles River is a small team track. Union Pacific local power lays up here and can be seen frequently. Once again, Metrolink and the occasional UP freight will pass beneath the east end of the bridge as well. Next bridge south is Fourth Street. The big attraction here is the Metro Rail subway shop -- the bridge spans the yard just south of the shop building. Weekends sees the yard chock full of subway cars. Alas, I was only there on weekdays when only empty tracks can be seen, so we'll bypass this bridge. Next bridge south is Seventh Street, and this is where you want to shoot from -- especially this year before the Sixth Street Bridge is torn down. We still have the same cast of characters, with Amtrak and Metrolink on the west side, Metrolink and UP on the east side. Next bridge south is the I-10 Freeway (we're in California, so we have to say "the" in front of freeway names and numbers), and once again there is (obviously) no pedestrian access. That brings us to Olympic Avenue. The west end of this bridge is directly over Amtrak's Eighth Street maintenance facility where the Surfliners, Coast Starlight, Southwest Chief and Sunset Limited call home (in fact, all the bridges from Seventh Street north to Cesar Chavez see deadhead moves of the long-distance Amtrak trains to LAUPT). 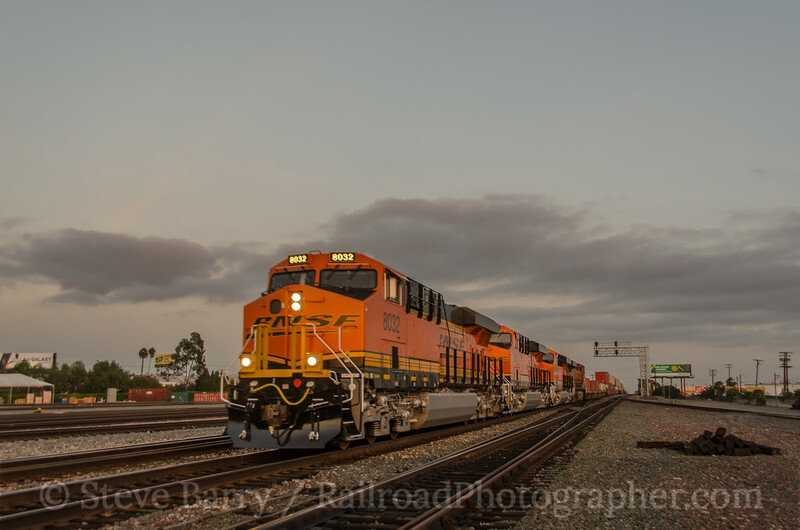 The next two bridges south provide a good look at the busy freight lines to the ports of Los Angeles and Long Beach, and are located just outside the city limits in Vernon. First is Washington Avenue, which parallels a concrete deck bridge used by Union Pacific trains. I did not get a chance to shoot here, as the shot is fairly non-descript. The next bridge south is 26th Street and it parallels two different railroads on two different levels. At street level is BNSF Railway heading from the Hobart Tower area (off to your right) to the ports (off to your left via the Alameda Corridor trench). Above BNSF is the passenger flyover used by Amtrak and Metrolink. The shot below shows the two bridges as seen from Harbor Junction. 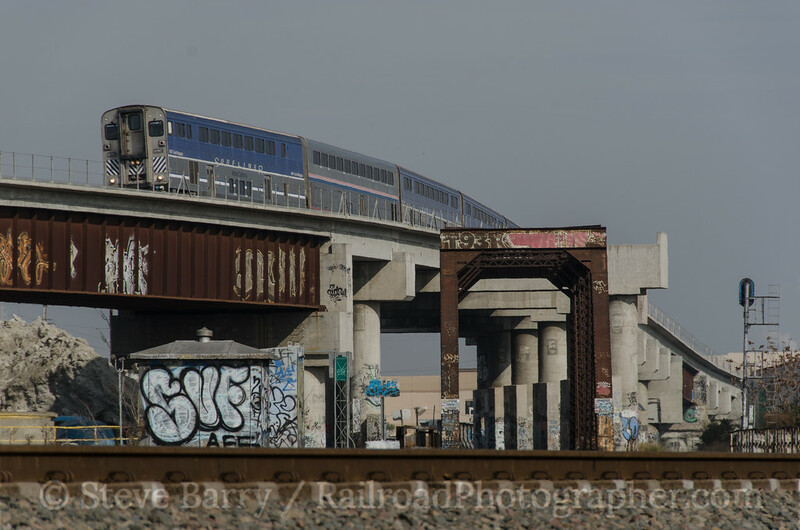 The Amtrak train is crossing the Los Angeles River, as does the through truss bridge on BNSF; both of these are very shootable from 26th Street. Two of the city's surviving towers are in this area, as well. Redondo Tower is almost impossible to shoot, but is located just north of Washington Avenue on the west side of the river. Hobart Tower is very easy to shoot and following 26th Street east will take you right to it. While we're in the area, let's check out one more bridge that is not over the Los Angeles River. Take 26th Street west; it does a bit of a curve as it crosses Santa Fe Avenue and puts you on 25th Street. At the grade crossing is Union Pacific's J Yard, and just beyond that is a bridge over the Alameda Corridor trench. A good shot can be had here (there is one spot you can shoot through the fence) with a Sears warehouse off in the distance. 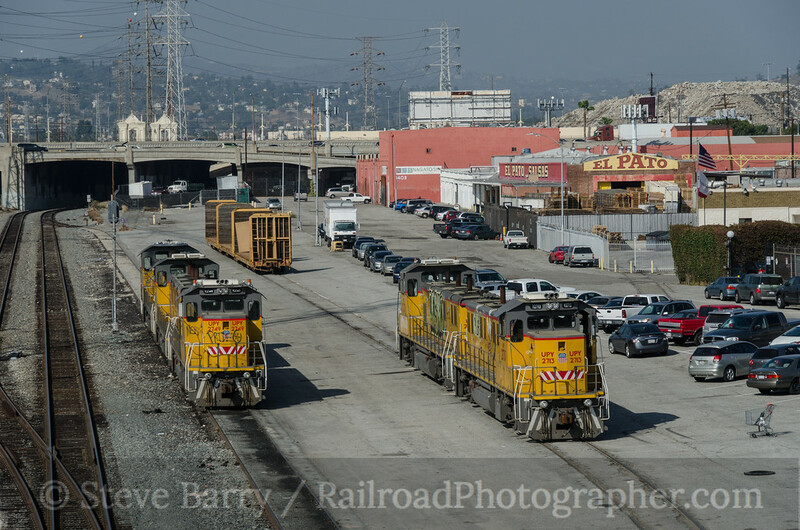 As mentioned above, just off to the right of this shot is Union Pacific's J Yard, so we'll take a quick peek in there. And since we're in the area, let's head back east on 25th Street, go across Santa Fe Avenue which puts us on 26th Street, and we'll follow it until we see Hobart Tower. While this post may make it seem like I really know my way around Los Angeles, the truth is I visited all these places (except Hobart Tower) for the first time in March 2014. I owe a huge thank you to Charles Freericks who gave me a primer on how to get around Los Angeles. I can't wait for my next visit there. On January 15, 1938, the city of Harrisburg, Penn., saw the arrival of its first electric-powered passenger train. On the point of the Metropolitan that day was GG1 No. 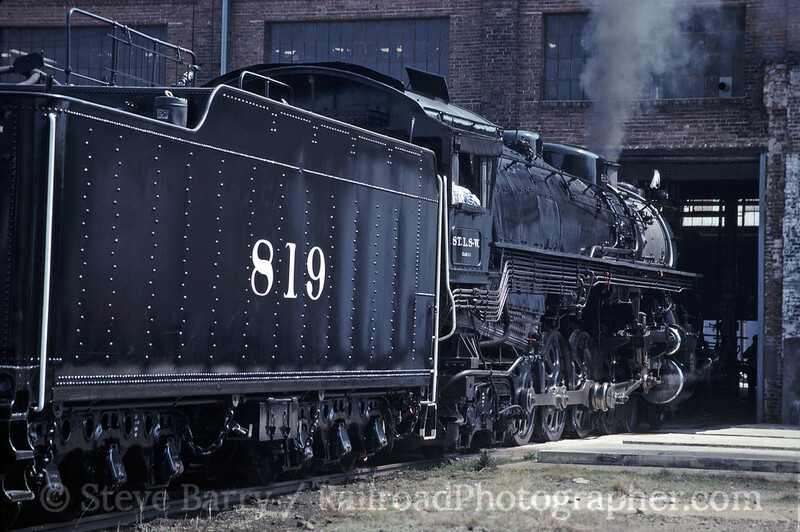 4859, built by PRR in its Altoona shops just a month earlier. This sleek GG1, designed by Raymond Loewy, would primarily power passenger trains for the Pennsy until 1964, when it was transferred to freight service (although it could be occasionally found pulling passengers on New York-Philadelphia "Clockers" or in commuter service on the New York & Long Branch in New Jersey). No. 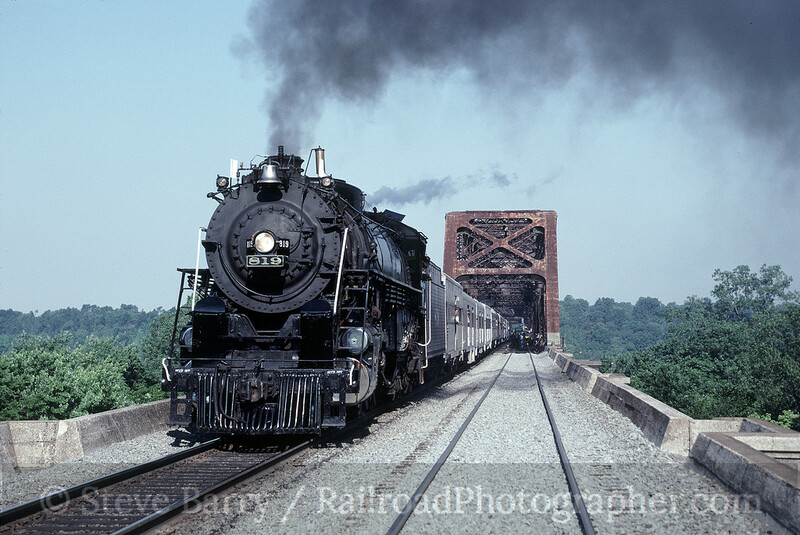 4859 went from the PRR to Penn Central in the 1967 merger, then on to Conrail in 1976. Conrail phased out electric freight operations, and No. 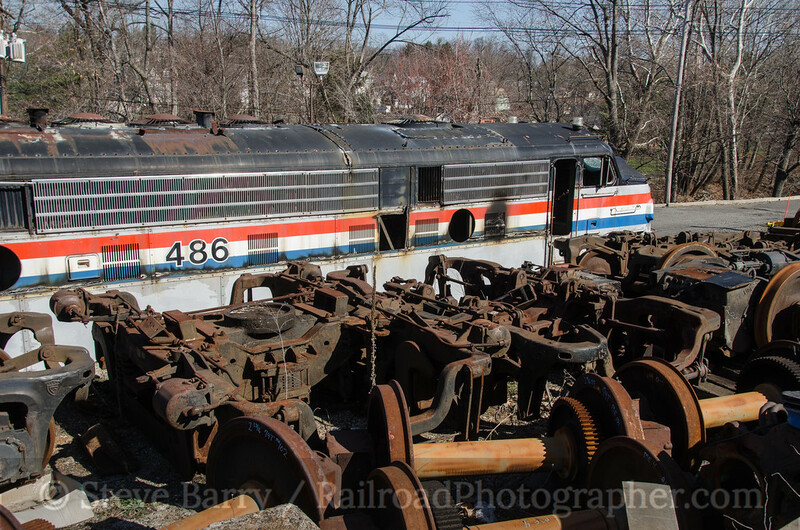 4859 powered the last Conrail GG1-powered freight before being retired in November 1979. 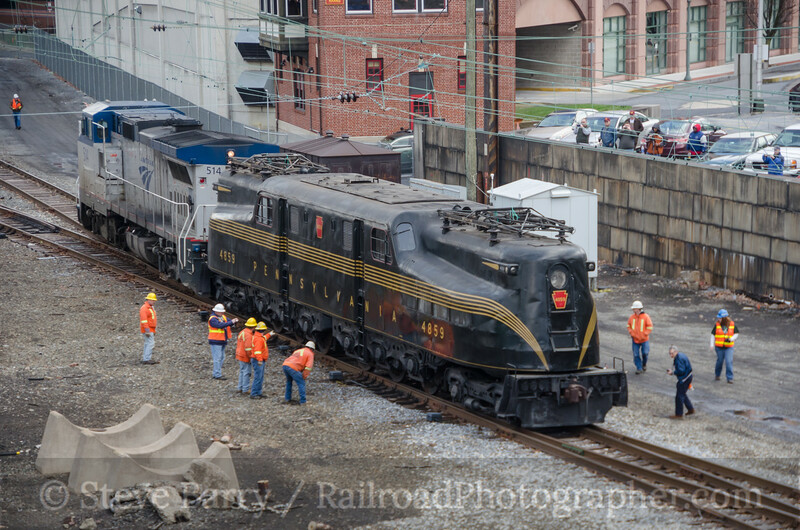 Noting the historical significance of the locomotive to its city's history, the Harrisburg Chapter of the National Railway Historical Society purchased No. 4859 and donated it to the Harrisburg Redevelopment Authority. 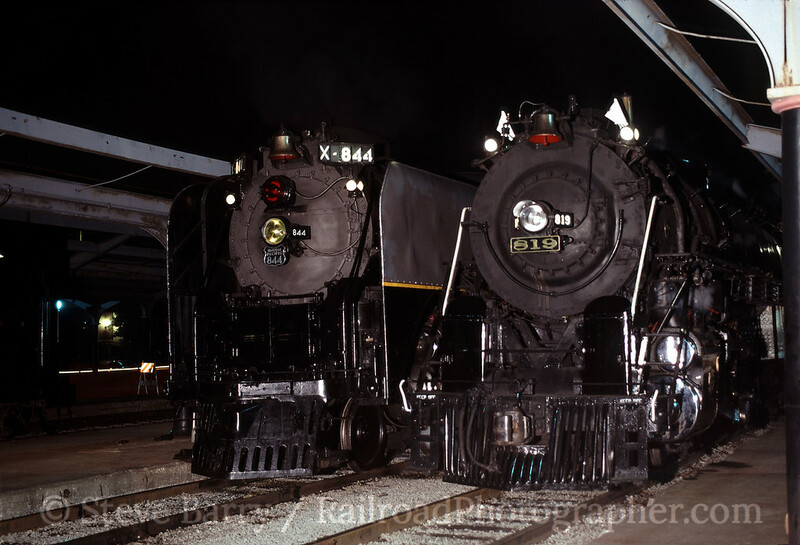 It was cosmetically restored, deeded to the Pennsylvania Historical and Museum Commission and moved into the Harrisburg Transportation Center (the former Pennsy station) on November 13, 1986. For the next 27 years it would sit on display under the train shed, ultimately being joined by caboose ("cabin car" in PRR terminology) No. 980016. 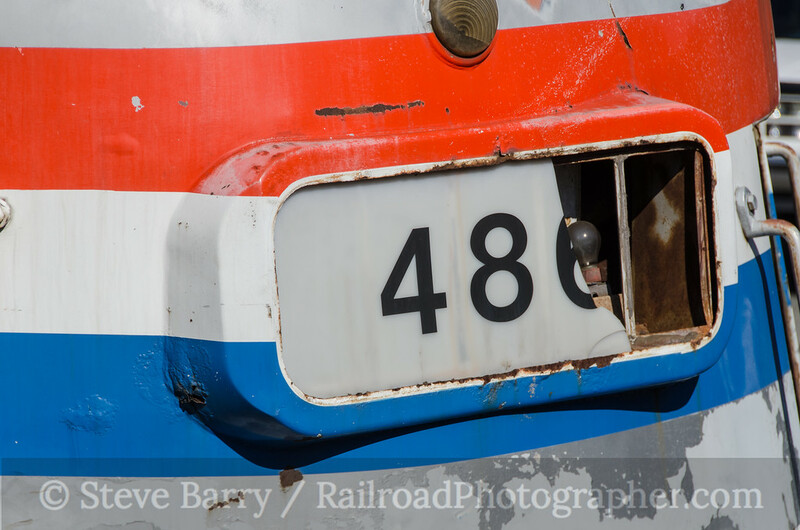 It has the distinction of being listed on the National Register of Historic Places twice (once in 1982 while undergoing restoration in Strasburg, Penn., and again in 2004 in Harrisburg) and was bestowed the title of the official electric locomotive of the state of Pennsylvania in 1987. The Harrisburg Chapter once again became owners of the locomotive in 2009 when it was deaccessioned by the Museum Commission. 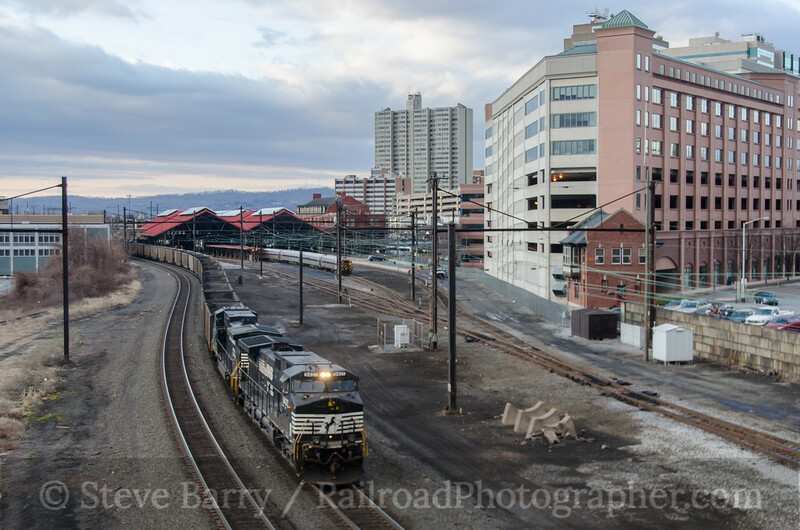 The Harrisburg Transportation Center is slated to undergo a massive improvement project, including new trackwork, signals and platforms, and No. 4859 was in the way. 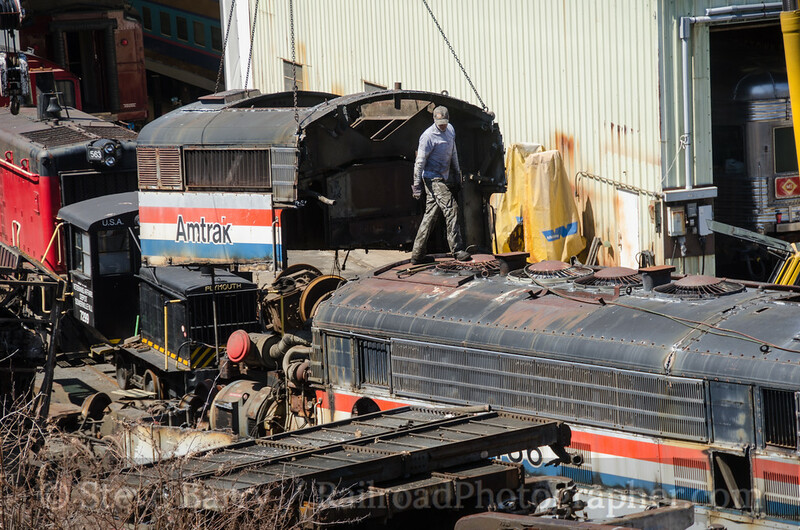 Amtrak and the Pennsylvania Department of Transportation devised a plan to move the GG1 and cabin car 1000 feet west of the station, where they would be "cocooned" for a three-year period; the cocooning will protect the equipment from the elements while still allowing air to circulate. April 5, 2014, marked the day of the move. 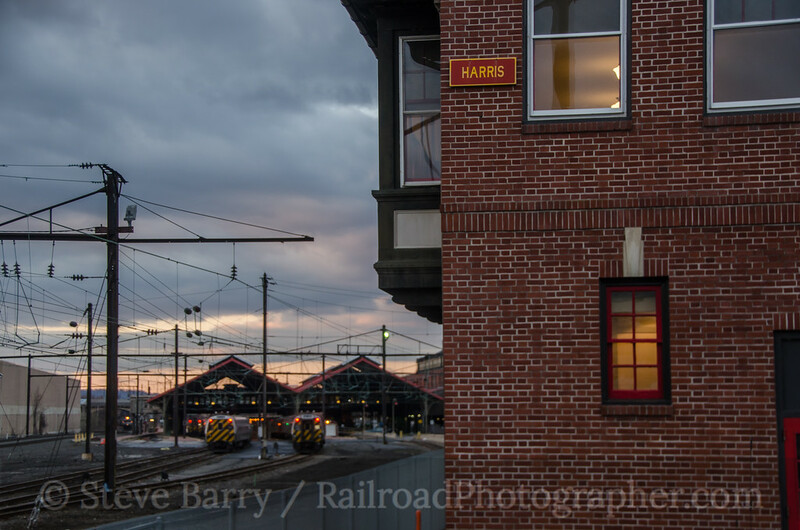 The sun was trying to peek through the clouds as rail photographers gathered at Harris Tower (also owned by the Harrisburg Chapter NRHS). On the radio scanner, the crew of Amtrak B32-8 No. 514 could be heard switching to get ready for the move. 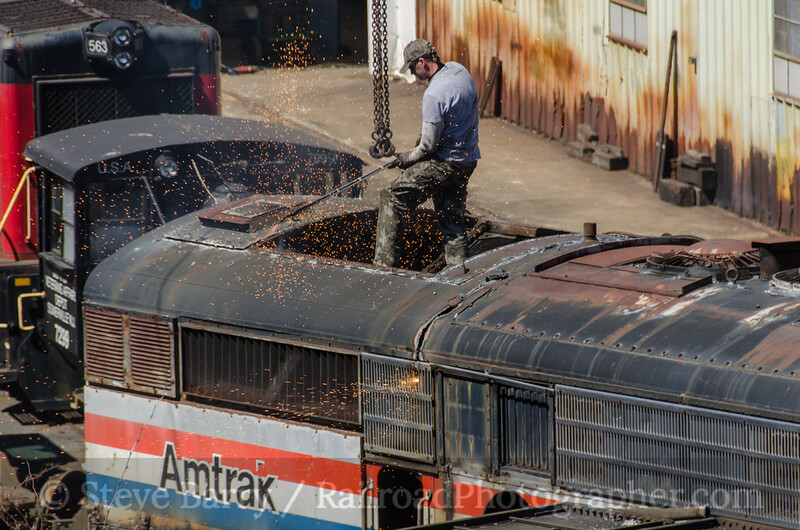 Amtrak greased the rails on some curves and switches so the long wheelbase of the GG1 could slide on through. 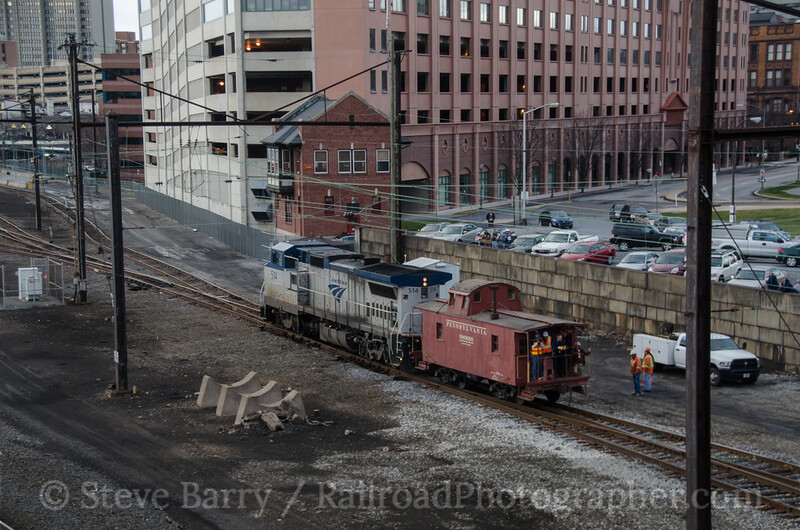 Norfolk Southern's busy main line passes next to the station complex, where freights swing off the former Reading Company main at Capitol Tower (just railroad east of the station) and onto the former PRR to continue west. First out was the cabin car. The display track is stub-ended, so Amtrak No. 514 had to first pull the equipment east, change tracks, and then push west past Harris Tower to the final storage location. 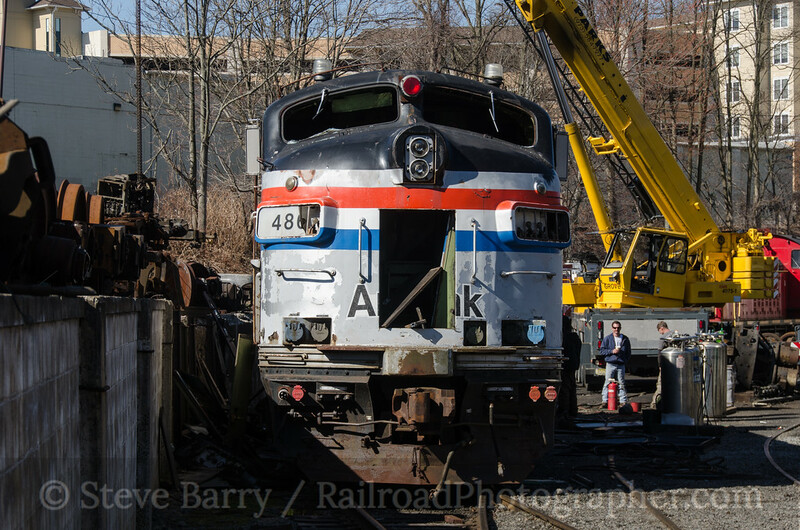 A group of Amtrak and PennDOT employees, as well as members of the media, were documenting the move from the ground and from the back of the caboose. 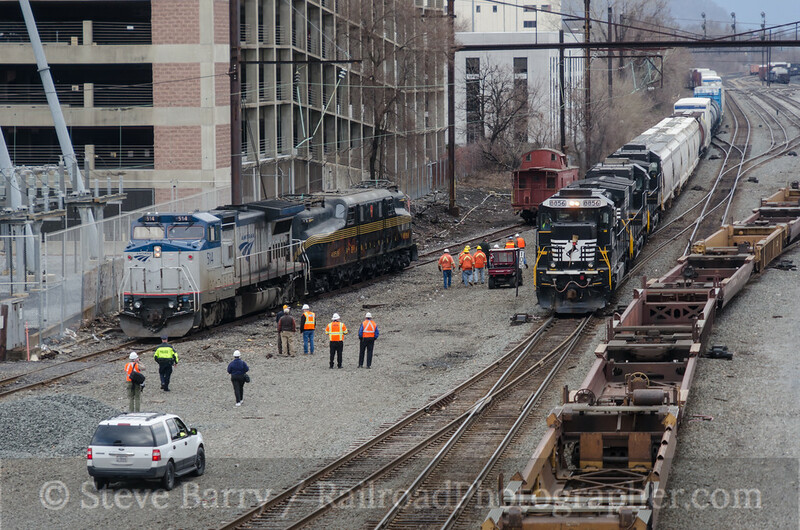 As the cabin car approached the end of the Market Street Running Track, where it would be uncoupled and left, a Norfolk Southern eastbound freight made an appearance. No. 514 went back to the station to retrieve No. 4859. Meanwhile, on the other side of the State Street Bridge, an eastbound Norfolk Southern train led by NS's Norfolk & Western heritage locomotive, was getting ready to head out. The photo line on the bridge watched as the nose of No. 4859 poked out from under the station canopy at the same time as the freight started moving. 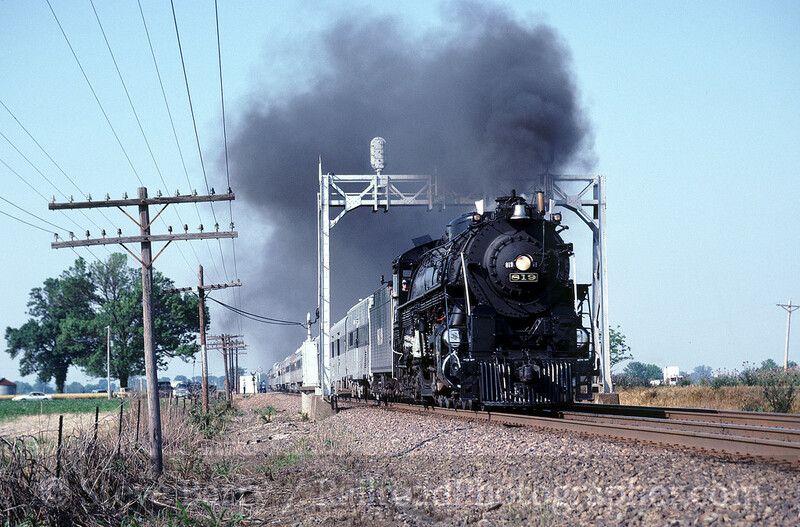 Was there time to run across State Street to shoot the freight and get back across State Street in time to shoot the GG1 passing Harris Tower. Everyone looked south, then north, then south again, then north again. As soon as it became apparent that there would be time for both, about 25 photographers charged across State Street to get the heritage unit. 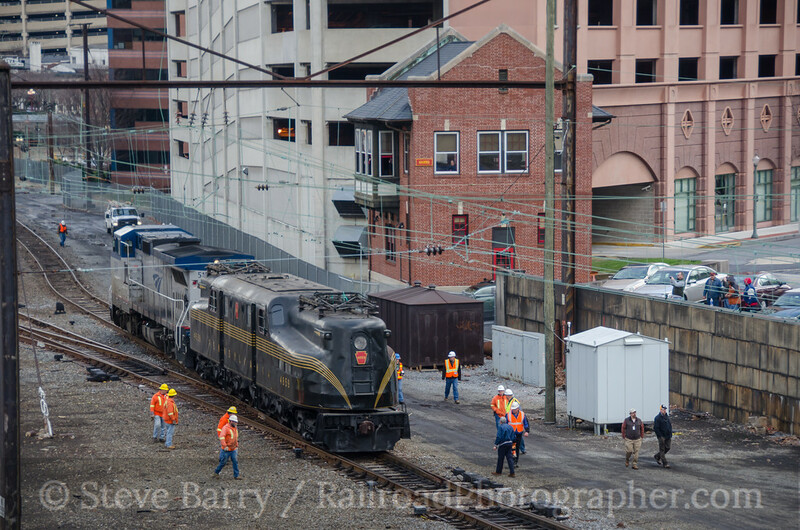 Racing back across State Street, the photographers got a Pennsy electric locomotive passing a Pennsy tower as No. 4859 gingerly stepped through the switches on its way west. Things stayed busy, as empty intermodal cars at the rear of the train pulled by the N&W unit, a second eastbound freight and the westbound GG1 all passed. In a few more minutes, No. 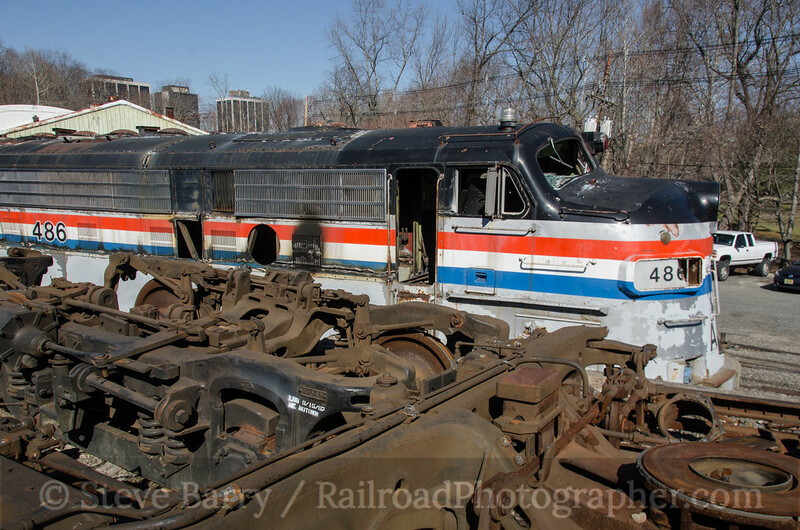 4859 would be reunited with its companion cabin car and the two would await cocooning. 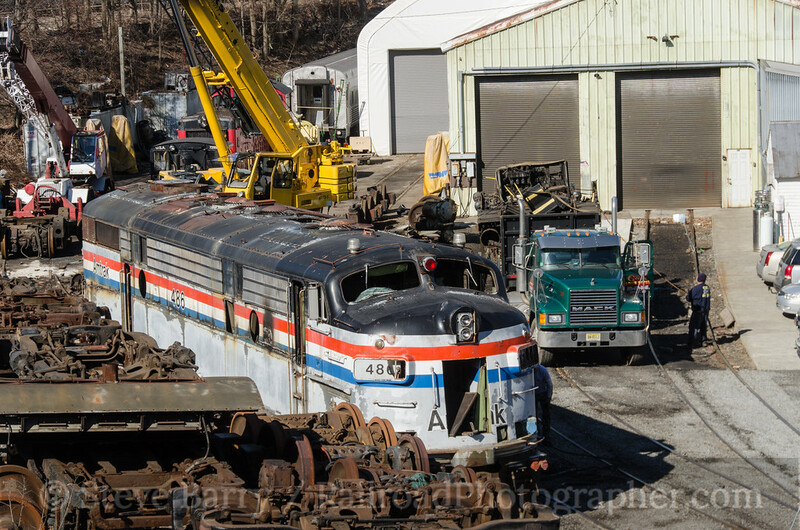 They will emerge from their cocoons sometime in 2017 and once again a GG1 will briefly move along the rails of the Pennsylvania Railroad. A complete photo gallery of the day can be found here. Cool Chromes is a semi-regular feature that looks at slides that have passed through the scanner. April 1st of this year marked the 38th anniversary of the creation of Consolidated Rail Corporation (better known as Conrail). 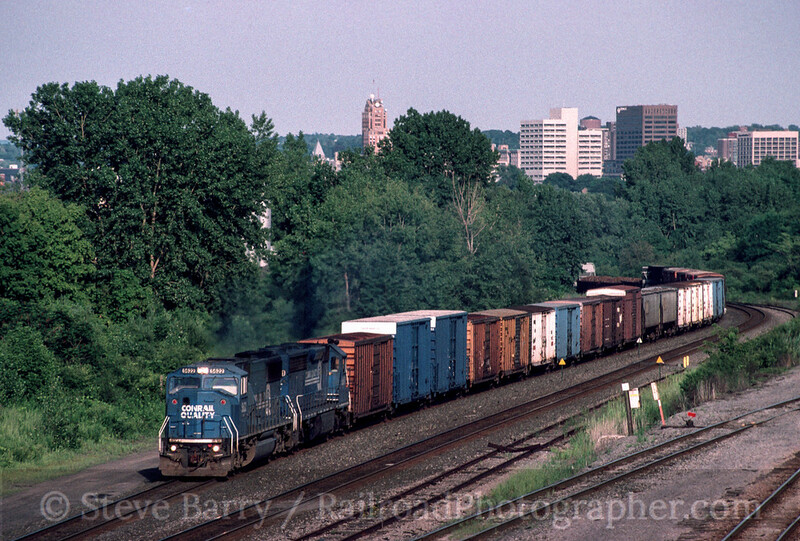 Since then, April has been a sort of unofficial "Conrail Month" among eastern rail enthusiasts, even though Big Blue ceased to exist in 1999. 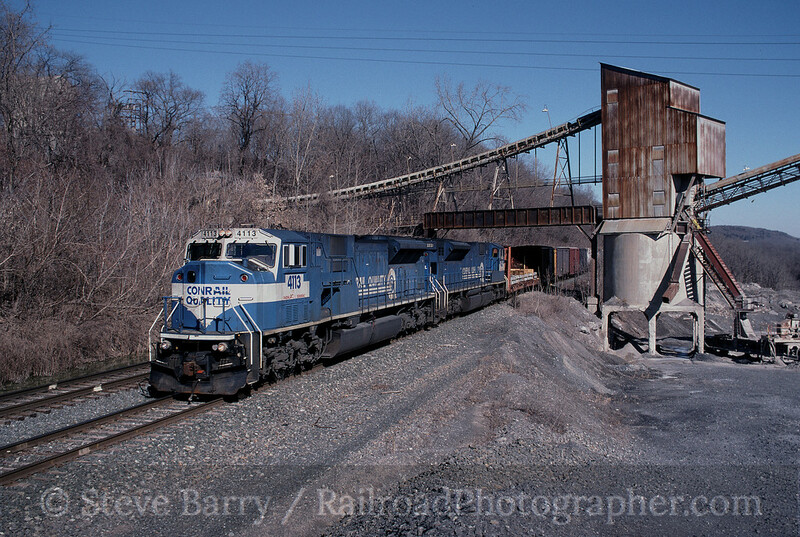 Conrail was certainly a fun railroad to shoot -- the locomotives were usually kept clean, and motive power consists were almost always matched blue units. I often headed to New York to shoot Conrail, and here are some of mu favorite Empire State memories to commemorate Conrail Month. 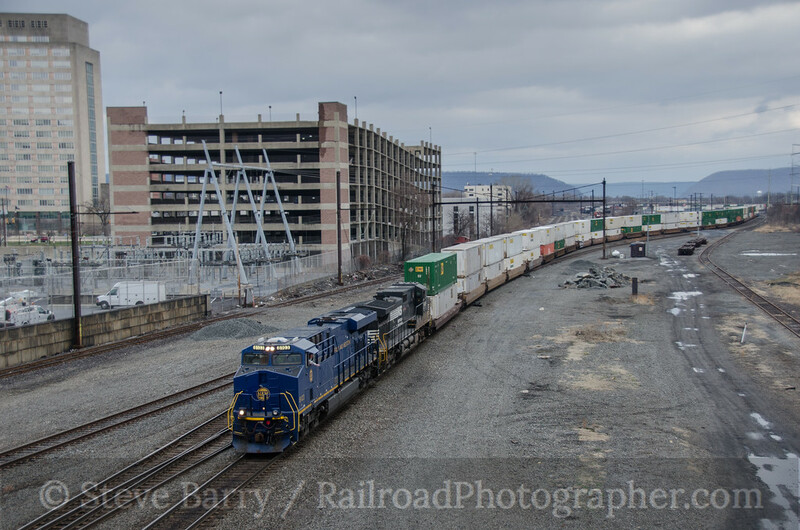 First up, we see a lot of blue power at Selkirk Yard (above) outside Albany -- Selkirk was the nerve center for trains operating on former New York Central and Boston & Albany lines. Trains from the west would proceed beyond Selkirk to northern New Jersey on the NYC's West Shore line or into New England on the former B&A (itself a NYC subsidiary). Selkirk was (and is) important to New England, as since 1974 it marks the farthest point south a freight train can cross the Hudson River and enter the easternmost states. 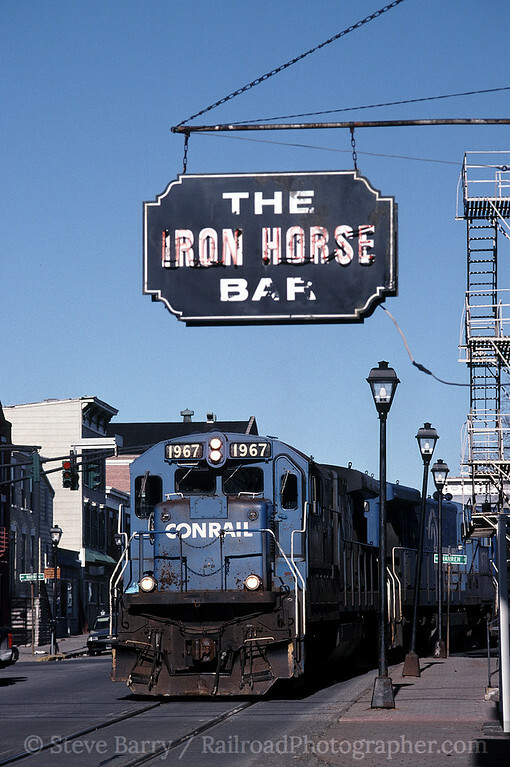 One of the coolest places to shoot Conrail was on the street running in Hudson. A local freight would diverge from the NYC main line and head up a steep hill to serve a grain mill. 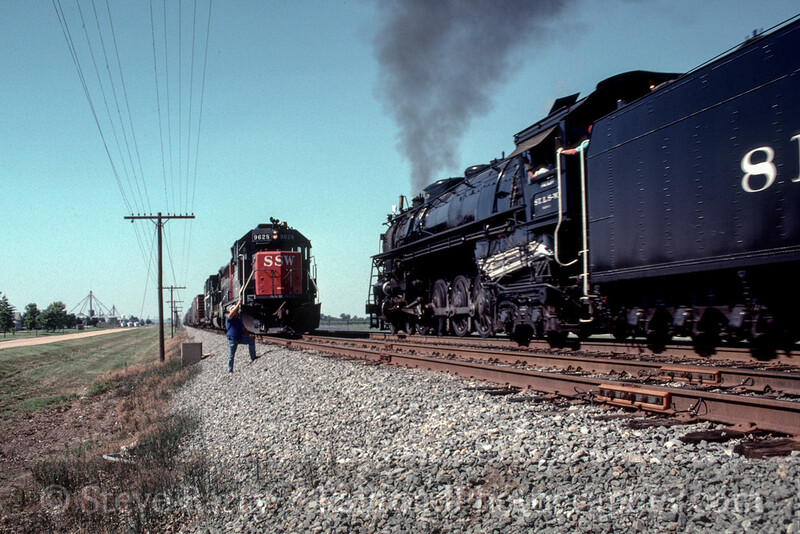 The return trip would find the train passing the Iron Horse Bar (left) as it made its way back down to the main. 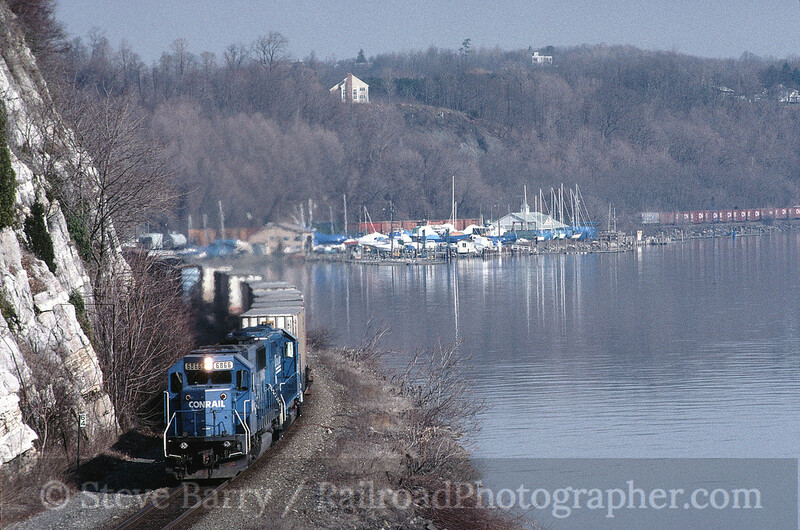 The day I shot the train in Hudson (February 22, 1999) turned out to be a pretty good one. 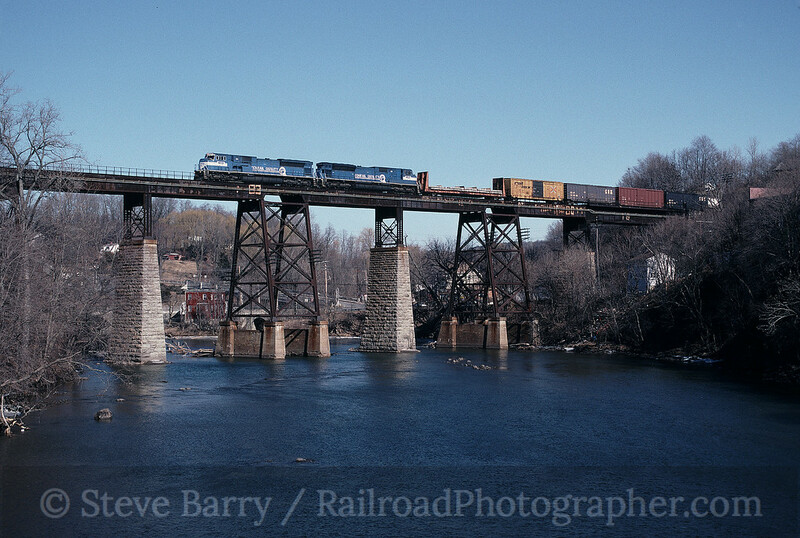 I set up at the big bridge in Catskill and was rewarded with a southbound train using a pair of Conrail's SD80MAC diesels. The '80MACs used alternating current to power the traction motors (most diesels of the era were direct current) and couldn't be mixed in consists with d.c. diesels. Thus, to make sure they ran only with other a.c. engines, they were made visually different by adding a white bow wave to the nose. Usually chasing trains on the NYC Water Level Route is a tricky prospect. Only local roads follow the tracks and train speeds are pretty decent. But for some reason the SD80MAC-led train ran into some slow going, and I was able to get ahead as it went through the cement plant in Alsen. Next we'll head west on the NYC and wind up in Syracuse. 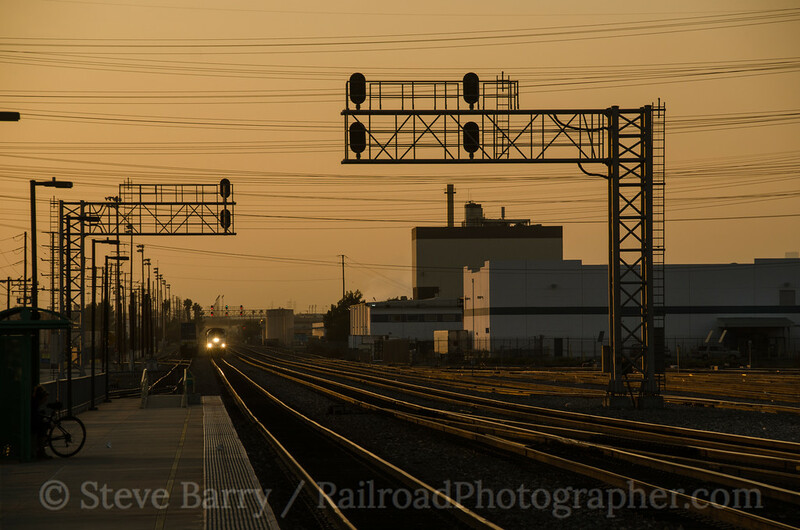 The city skyline forms a backdrop as a westbound train leaves town in late afternoon on a hot summer day. 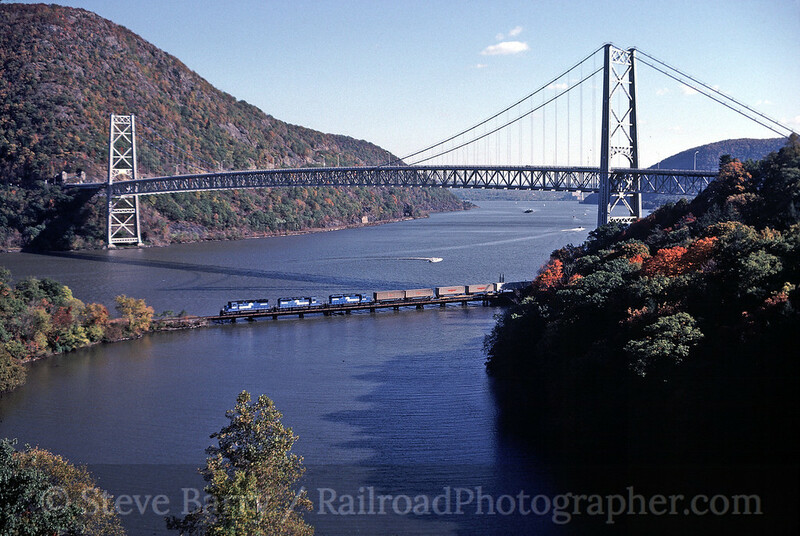 Of course, the best place to shoot Conrail in New York was the Hudson Valley. One day I went exploring near Marlboro and wondered what the shot was like around the curve south of town. As I got a bit more than a half-mile from the crossing I began to see something above the tracks; it kind of resembled a bridge. It turned out that there was an abandoned quarry or something along the tracks and a loader spanned the railroad to load barges on the Hudson. The loader hadn't been used in a few years, by the looks of things, and it did appear rather rickety. 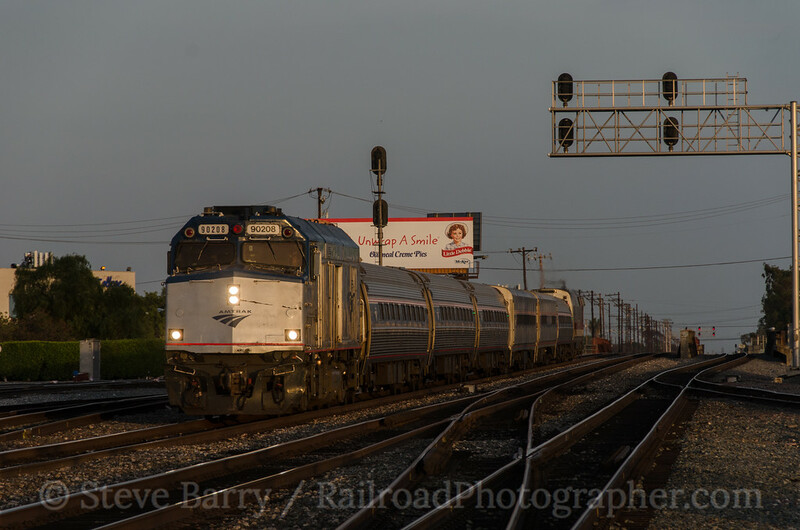 Nonetheless, I made my way out onto the loader and was rewarded with a nice shot of a southbound train. Of course, the best place in the Hudson Valley to shoot was -- and remains -- Bear Mountain. We finish our look at Conrail in New York by standing on the Route 9W bridge overlooking the Conrail bridge over Popolopen Creek. Bear Mountain is slightly south of here, and the bridge of the same name spans the Hudson; that's Anthony's Nose (named for Mad Anthony Wayne) on the other side. 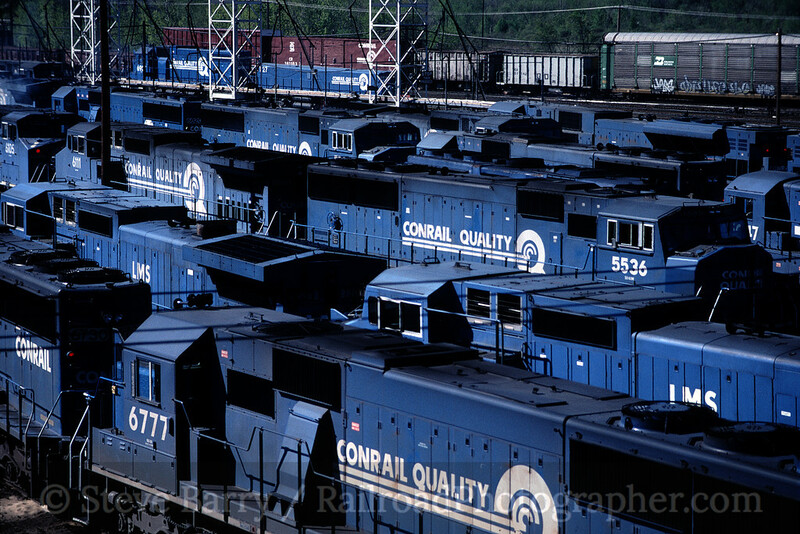 A complete Conrail gallery can be found on the website here. A complete New York State gallery can be found here.